The following awards have been presented to the Hallowed Haunting Grounds. Thank You all. Be sure to follow the links to the generous sponsors. Through the efforts of enthusiast Craig Endler, and through the auspices of City Councilmember Wendy Greuel, on the twenty-first day of April 2006 the City of Los Angeles presented a Certificate of Recognition for his service to the community. We very much appreciate the effort and the recognition. The Hallowed Haunting Grounds was featured in the inaugural issue of Haunted Media DVD Magazine as it is now called. 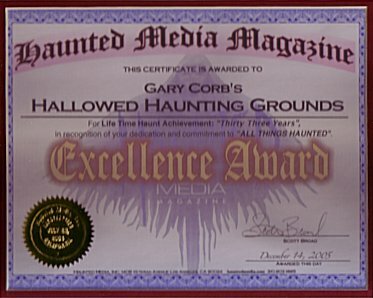 We were honored then, and later, when the publisher of Haunted Media Magazine saw fit to present to us their "Excellence Award." We highly recommend visiting their web site and ordering their fine product. Each year a group of Halloween enthusiasts from all over North America submit pictures from their Halloween displays for inclusion in a video complilation. For the first time, in 2004, a video of the Hallowed Haunting Grounds was submitted. Of course, any collection invites comparison. These haunts were judged and awards given recognizing efforts worthy of special attention. On February 20, 2005 the first of these awards were presented. 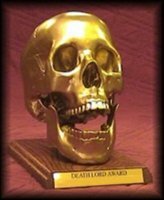 The "Death Lord Award," also known as the "Golden Bucky," (later called the Haunt X Award,) was presented at a convention called "Death Fest IX." These awards were created by Mr. Wil Schock and are voted by the awards' sponsors. 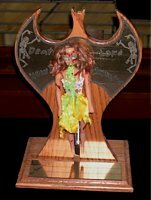 The Hallowed Haunting Grounds was presented the "Golden Bucky" for the Best Yard Haunt of 2004. That award was sponsored by SpookyFX and was presented by Mr. Jerry Chavez. The trophy is a "gilded" and mounted 1st-class "Budget Bucky" skull from Anatomical Chart Company. 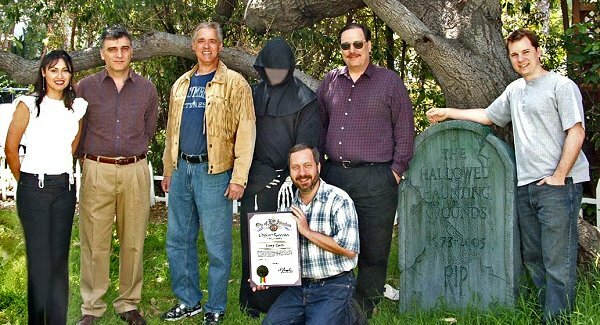 The creators of the Hallowed Haunting Grounds were also honored as the Best Home Haunter of the Year and inducted into Death Lord's "Haunters' Hall of Pain." That award was sponsored and presented by Mr. Scott Ribbens. On May 4, 2005, the votes were finally tallied for the Haunters' Choice Awards. These awards are based on the same video complilation, but they are voted by anyone who certifies that they have viewed and evaluated the video submissions. The Hallowed Haunting Grounds was again selected as the Best Yard Haunt of 2004. We appreciate the honor. The trophy is a Ghost Ride Productions "Pumpkin King" Statuette that was Donated by "The Colorado Contingent." Additional prizes were contributed by Bronson Boneyard, Jim Upchurch at 11th Hour Haunted House, Jason Reese at Rusty Knife, and Jeff at The Frighteners. 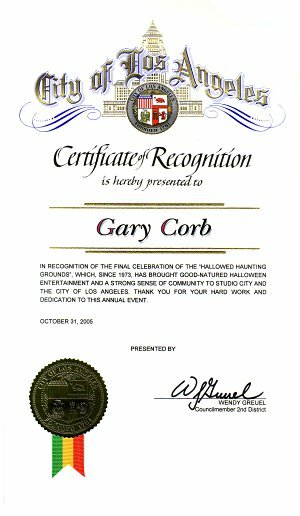 The following awards have been presented to HauntingGrounds.org. We are happy to post them here. Since it is our policy to not solicit such awards, the complements are most appreciated.